How Did The Horgan Harness Come To Be? Maddie is a loving 10 year old pit bull rescue and the inspiration for the Horgan Harness. So How Is The Horgan Harness Different From Other Harnesses? The patented Horgan Harness is different from other harnesses in several different ways. Most importantly, the Horgan Harness is designed to control the dog from the back legs, rather than the front of the dog like every other harness. As many people do not realize, 70% of a dog’s strength come from the back legs. The Horgan Harness is designed to control pulling at the source, without choking or inflicting pain on the dog. Also, unlike most harnesses, the Horgan Harness was created by a board certified surgeon and critical care veterinarian extremely knowledgeable in the anatomy and physiology of the dog. Is It Easy To Train My Dog To Use The Horgan Harness? Yes, it is easy to train dog’s to use the horgan harness. Many dogs are trained off the Horgan Harness. 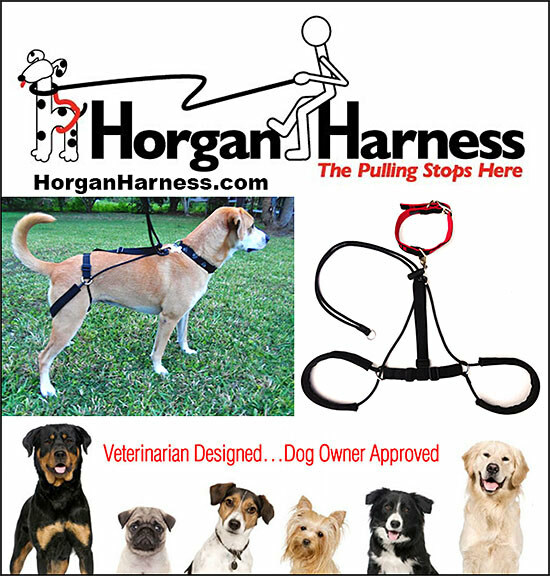 In fact, we sell the horgan harness to many dog trainers world wide. Dog's adapt extremely well to the Horgan Harness. What About Multiple Sizes --For Even Small Dogs? Yes, you can get a Horgan Harness for your little dog too. We understand that the Trachea of small dogs is particularly vunerable The Horgan Harness comes in four different sizes. Small, Medium, Large and Extra Large. The small fits dogs as little as 5 pounds. What Do Dog Owners Say About The Horgan Harness? Thank you, thank you, thank you for creating this harness! I used it today for the first time and truly enjoyed walking my 5 year old Brittany, Marley. I have tried nearly everything to stop the pulling, with no luck. I am actually excited for our walk tomorrow. I will be a customer for life! This is the ONLY thing that has worked for my 95 pound lab and I think I had tried them all. My dog seems to like it too - he looks like a proud horse with it on! On a recent hike a squirrel jumped out close to him - he lunged for it and the harness immediately collapsed his back legs. Without this harness I would have been pulled to my knees. I am going to add a sleeve of lamb's wool or something to the leg loops since he is a shorthair and on longer walks his skin gets a little irritated. Thank you so much for this humane and effective solution! Awesome product! I have an 80 lb Belgin Malnois with turbocharged hind quarters. We didn't walk before the Horgan Harness, we wrestled our way up and down the road. I ordered the Horgan Harness out of sheer desperation, hoping that this would be the item that did what it said it would do. Sheila was excited when I opened the box. She knew it was for her and could not wait to have it put on. Making a long story short, she loved the harness at first sight (imagine!) and we merrily went for a w a l k. Amazing. Thank you for this wonderful product. Is The Horgan Harness Affordable? Yes! Being in control is not only peace of mind- but it is freedom from the liability worry that your dog could get loose during a walk with tragic results! With affordable prices starting at $29.95- $39.95 and a small fee for shipping, there is NO reason why every dog and owner can't enjoy the peace of mind and safety that the Horgan Harness affords dogs and the families that love them. Call today-- you'll be so glad you did.